Welcome to Atlantis House the most private and unique Guesthouse in Key West. As the only guesthouse along the beaches, we offer just 2 exclusive suites both featuring private over-sized Jacuzzi baths, perfect for Romantic getaways and Honeymooners! Recently awarded 'Travelers' Choice' for the top 25 best Inns in the United States. Also awarded by our Guests with the 'Certificate of Excellence' for 2009-2017 and awarded the Best overall 'Top 10 in the US.' Rated #1 for 2016 and 2017 out of 77 Inns in Key West! Contemporary architecture houses beautiful decor and lush gardens. 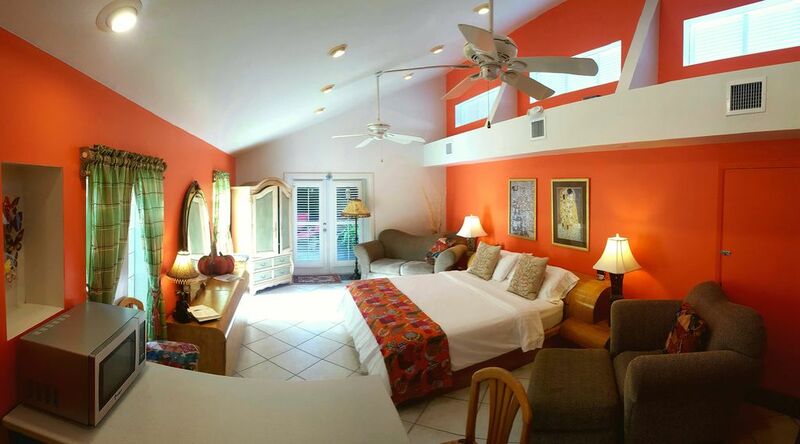 The Master Suite which sleeps 2 ranges from $225 off season-$325/night in season. The Garden Suite VRBO # 649536 which sleeps 2 ranges from $189/night -$250/night. Both rooms together can sleep a total of 4 and ranges from $394-$575/night. The Master suite at 600 sq ft, has a king size bed, 17 ft vaulted ceilings, ceiling fans and recessed lighting on dimmer switches, central AC, tiled floors, Ipod Docking Station, 40 in HD Flat screen TV, music system with a choice of 50 channels of commercial free music, kitcenette w/wet bar, large wrap around bar, wet bar, fridge, microwave, coffee maker, with an oversized 10x16 bath featuring a 9 ft vanity with double sinks over which hang Baroque framed mirrors, make-up vanity, separate water closet, spacious clear glass shower, and a huge Jacuzzi tub with a skylight overhead. The Garden suite at 350 sq. ft enters through French doors from the deck into a sitting room has a daybed that is covered with overstuffed pillows over which hangs a cranberry tulle netting, an etagere with 40 in HD Flat screen TV, music system with a choice of 50 channels of commercial free music, small library & a collection of gold gilt mirrors surrounding a sunny windowsill. The bedroom has a queen bed w/Jamaican wicker nightstands, Ipod Docking Station, wet bar area with fridge, coffee maker and microwave. The 8x10 bath is tiled with an open shower & bench, vanity, 9 ft vaulted ceilings, skylight, and a large Jacuzzi tub for 2. Steve, a licensed USCG Captain, with over 9,000 hrs on the water, charters his Contender and takes guests on private fishing trips and exclusive to Atlantis House, Steve and Kayla will prepare you dinner with the 'catch of the day'. He also offers private guided snorkeling tours at the only coral reef in the Continental United States. And for those with a taste for Lobster, Steve will hand catch you lobsters for dinner. For couples with a sense of adventure that want to get away from it all, Captain Steve with an extensive Marine biology background offers private island adventure/eco tours to secluded natural beaches where you can take a peaceful stroll along the beach and pass the time having lunch and snorkeling for marine life and seashells. NBC. Com Travel featured Capt. Steve's Eco-Tours as a best kept secret of Key West and the Florida Keys! Kayla, a licensed massage therapist (LMT and NMT), with over 15 years of experience offers relaxation 'island style'. Living in Key West for 24 years and operating the guest house for 23 years, both Kayla and Steve are dedicated to making your stay as enjoyable as possible and are happy to make suggestions and arrangements for myriad of island activities from casual to fine dining ideas, sunset catamaran or tall ship sails, diving and water sports, to private secluded island adventures to wile away the day while basking on a tropical sandy beach. So come find yourself again at Atlantis House. On the edge of Old Town and the historic Casa Marina District. We are located centrally along the beaches of Key West on the South side of the island. We are located on the edge of Historic Old Town Key West and the Casa Marina District along the BEACHES. 40 yds from the Ocean! We stayed at Atlantis House for 3 nights in April of 2019. It’s a perfect option for those who want a peaceful place to come home to after dinner out on the town. Steve and Kayla (the owners) really thought of everything. We rode the bikes provided everywhere and it was faster and much more convenient than driving. You can get to Duval in no time. We highly recommend this place, you will love it!! We had a fantastic stay. The owners were so kind and the suite was gorgeous. Truly a tropical getaway to remember! We will be back! Thank you for the wonderful review! It was our pleasure hosting you and look forward to a return visit! Wonderful accomodations in a great location. Steve and Kayla have done a great job with this property. It’s clean, comfortable and had what we needed for a great stay in Key West. We loved the location, as it was just far enough from the noise and activity of Duvall St., but close enough to get to by bike or Uber when we wanted to join in. Capt. Steve took us on an amazing Eco trip, about 13 miles west of Key West, and Kayla gave us much needed massages. I highly recommend this property if you’re heading to Key West! Thanks again, Jeff, for staying with us and taking the time to write the reviews!! Hope to have you as a return guest if you make it back to Key West! A hidden paradise in Key West. Steve and Kayla are attentive to your EVERY need. Get a slice of Kayla’s key lime pie and then use their bikes to bike around the island and enjoy the amazing tropical climate. The suites are impeccably clean and comfortable. The outside backyard amenities are fantastic. We highly, highly recommend! Beautiful property! So quiet and elegant yet very close to the beach, restaurants, and Duvall street. And Capt. Steve and Kayla are the ultimate hosts! You must try Kayla’s delicious homemade key lime pie! We will definitely be return guests. Thank you for review. It was our pleasure hosting you! Cancellation Policy: Because of our small size, cancellations affect us significantly. Your deposit is non refundable. In the event you cancel your deposit is credited towards a future stay. We must know 20 days before your scheduled day of arrival if you will be canceling. If you cancel after that point, you will be liable for any days, up to the entire length of your booking, that we are unable to rebook. There are no refunds for early departure.